Did you know anyone in the community can experience key skilled services from Barnfield College students at our New Bedford Road Campus? Our Retail Quarter is the home to ‘Salon B’ our on-site professional hair and beauty salon, and ‘The Brassiere’, our college restaurant delivering a delicious dining experience for members of the public. At Barnfield we know experience makes the world of difference in preparing our students for life after college – be that chasing a career in their chosen discipline or moving into further education. Both our salon and restaurant enterprises enable our students to sharpen their skills in real time – working on real clients and delivering a professional standard in everything they do. Our services offer great value – experience a three course or buffet lunch for a great price, or pamper yourself with your favourite beauty treatments for just a fraction of the price of the High Street. We’re thankful to our loyal clients for their ongoing support over the years, but would love to welcome more faces to enjoy what our students can offer. Our professional hair and beauty training salon is open Monday to Friday for day and evening appointments, with hair and beauty products available for sale at excellent prices. We offer fully supervised ladies’ and men’s hairdressing, and pampering. See the Salon B price list. For reservations please, call 01582 569 590 or email hairandbeauty@barnfield.ac.uk. Our professional training restaurant offers exceptional service and delicious cuisine for lunch and dinner. We’re open for lunch on Thursdays and Fridays. 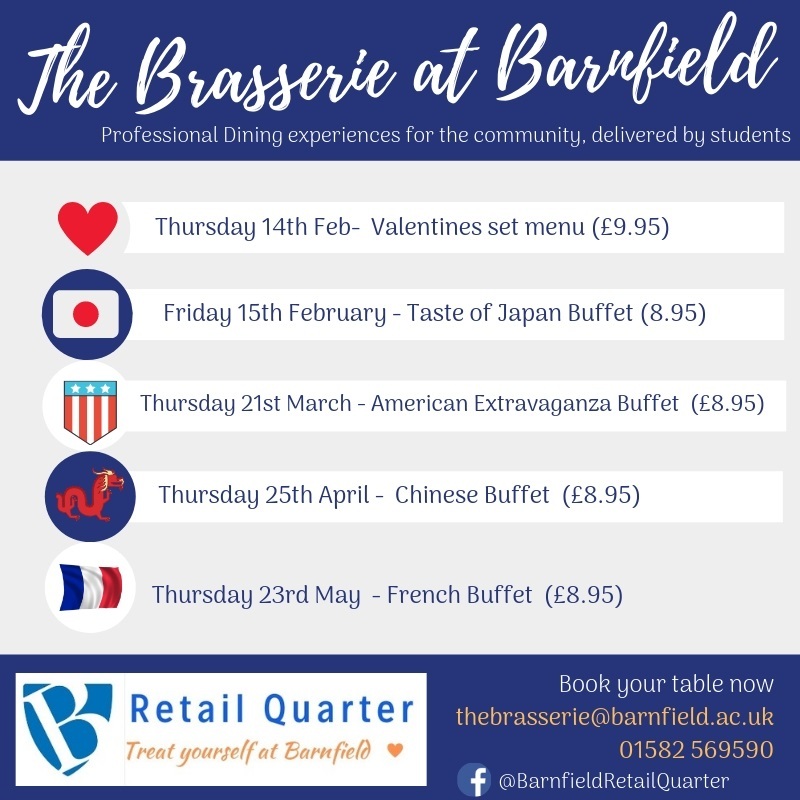 To make a reservation for dinner, please call 01582 569 590 or email thebrasserie@barnfield.ac.uk. Please note, Café B has now closed as of 9 February 2018.